Woman's kind-hearted gesture could change a homeless war veteran's life forever - and she's inspired others to do the same "Nobody should be alone. Nobody should be on the streets with nobody to support them"
A woman's kind deed in helping a homeless war veteran has moved thousands – and caused the start of a ripple effect, inspiring others to do the same. 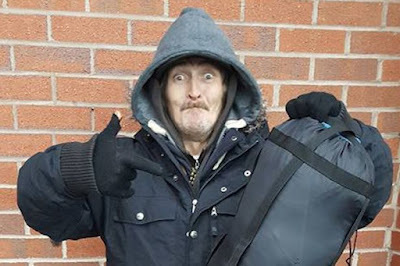 Kerry Stewart, who lives in Darwen, Lancashire, shared on Saturday a sad story about a homeless man called Kevin, whom she'd met late one evening in Blackburn. Kerry writes that she first met a man called Kevin in a retail park. She bought him a cup of tea and a muffin and got chatting. Kerry says that she and her daughter spoke to Kevin for some time, and "learned that Kevin is not an addict or alcoholic, as many will presume, but is an ex-squaddie who came back to Burnley from the Army to find his wife shacked up with someone else." Kevin apparently left his children, his dog, and now sleeps rough. He says that he stays away from local hostels as they're "full of junkies and dodgy landlords". Mum Kerry continues in her Facebook post that she provided Kevin some clothes and food . She's carried on meeting up and finding out more about his life. "Clearly suffering with PTSD, he cried when he told me of his recurring nightmare remembering the sight of body parts in an Iraqi village, most notably the arm of a child," Kerry writes. She adds that Kevin told her "nothing could have prepared him" for a life after the Army, and it seems like he's suffering from post-traumatic stress disorder.